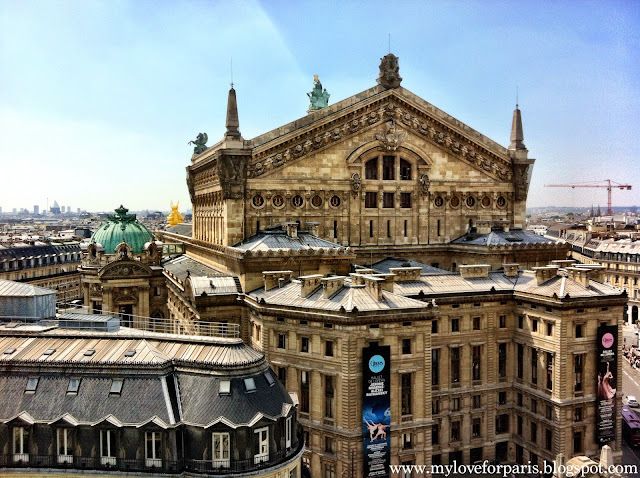 My Love for Paris: Another (free!) 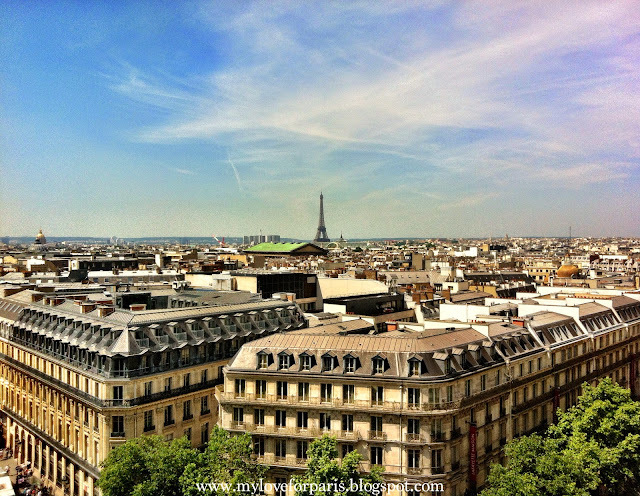 Parisian Rooftop View! Another (free!) Parisian Rooftop View! The Parisian skyline is one view I can never seem to tire of, which also means that I spend a lot of my time forever seeking out rooftop views - by day or night (for example from here, here, here and here!). More specifically, I am always on the hunt for free, incidental rooftop views, ones that aren't so much crowded by long winding lines of tourists. 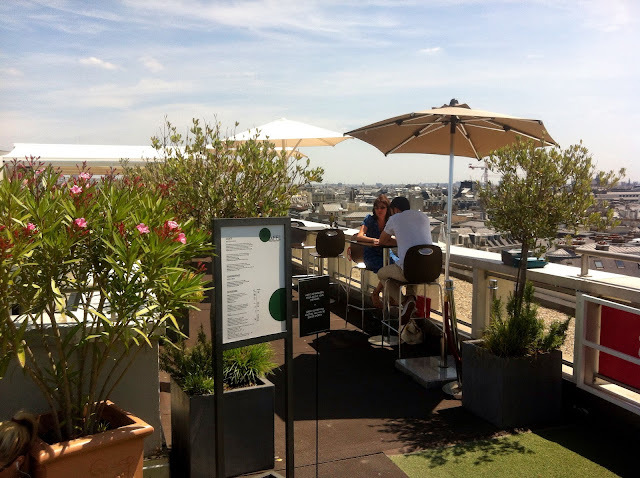 My latest find is a Summer rooftop right next to my current (free) favourite rooftop view on top of the Printemps building. 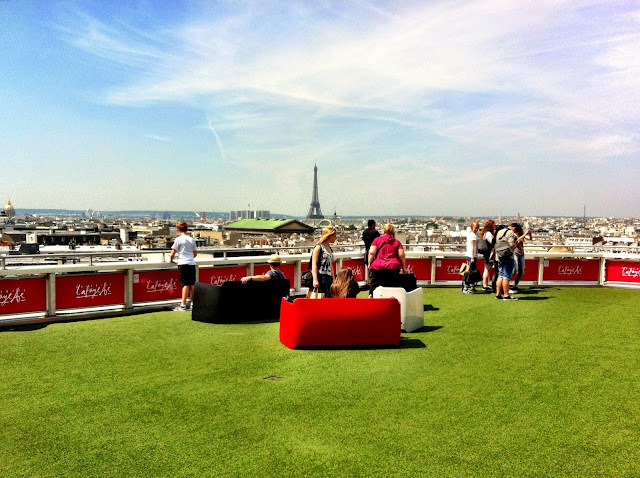 It's on the very top floor of the Galeries Lafayette building where I recently met up with a girlfriend for a little vitamin D session. Not a bad welcome hey? So I thought I'd get a closer look, as another thing I can't seem to get enough of are Haussmann era Parisian buildings. I love the colour scheme of Parisian skylines, I don't know why. I also love the little pop of jade green and gold that occasionally appears out of nowhere but never feels out of place. As for the fake lawn, well that may seem, a little.. fake. Not that there's anything wrong with it! It's definitely more practical and it certainly helps to create a rooftop "garden" feel (to the best of its ability). 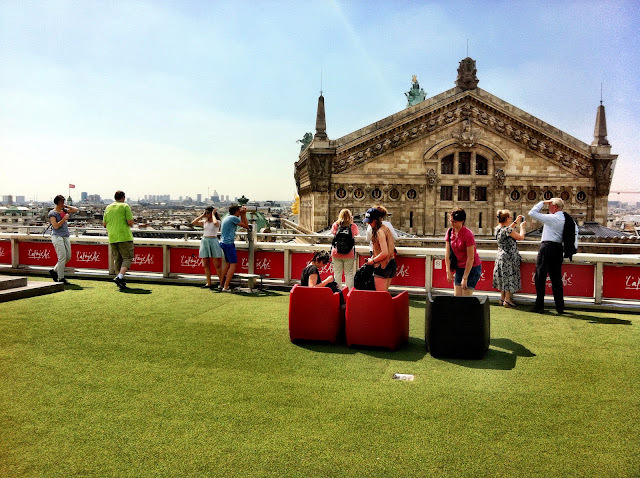 Loads of Parisians buy their lunch then bring it up here to eat on the "lawns". Some even bring packed lunches and sit in circles, reminding me of lunchtime in Year 8 when we would sit around in circles on real lawns for lunch, sometimes standing up with a wet patch on our school uniforms from those real lawns themselves. Otherwise, there are also a few quite reasonably priced little stalls/food carts selling snacks, drinks, icecream, bagels etc. There's also a proper café available for dining if you are looking for something a little fancier. As for my girlfriend and I, we decided to grab a bagel "formule" which included a drink, a dessert and a bagel for under 10€ as I recall. We sat around munching our bagels (I know, it's not very French but there are certain days when you just don't feel like a baguette!). We chatted away in our deteriorating English and soaked up the sunshine to top up our respective vitamin D deficiencies. And I have to say, it's times like these where I find myself gazing off into the distance, briefly distracted from the immediate conversation. For a split second I have one of those "OMG-I-can't-believe-I'm-in-Paris" moments and I remind myself that Paris is probably one of the best places in the world to be 'poor' (in a first world sense). Admiring a breathtaking view like this is for free. There's no need to purchase a ticket, no obligation to purchase any food or drink. Heck, you can even bring your own packed lunch if you really wanted to. I can't believe I'm the first to comment here! 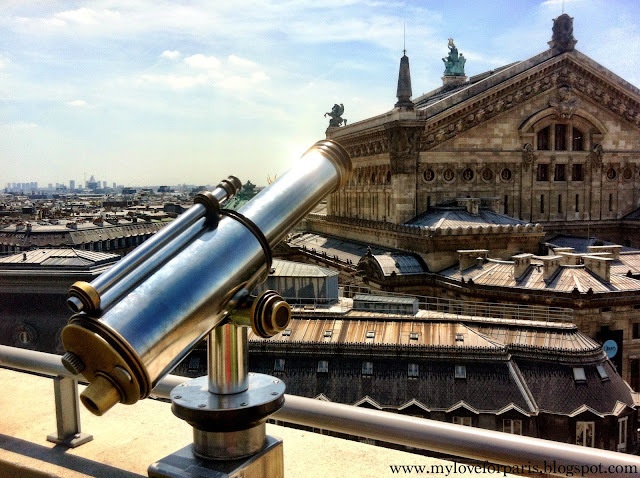 Thank you for so generously sharing the view from Printemps and Galleries Lafayette - I'm going to bring my husband and son to get this stunning view as a surprise for them next week. I'm going to explore your blog for more gems. We have just 48hrs there so want to make it count. 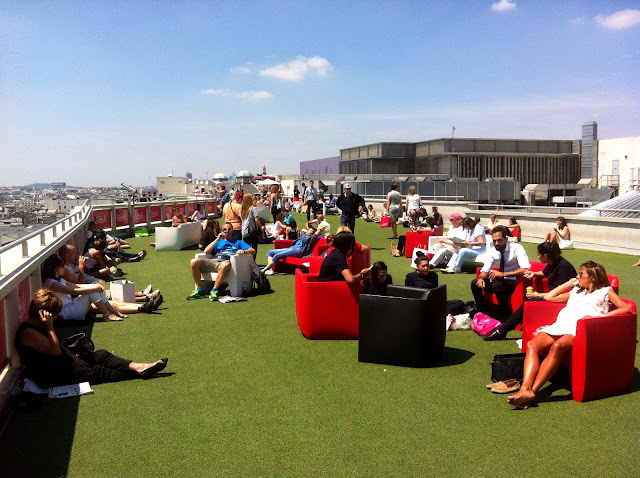 Sorry for the delay my comments have been going to Spam for some reason :( I hope you enjoyed the view, I love surprising my visitors with this rooftop view because there's no clear signage and I can trick them into thinking we are just browsing in a department store until BANG! SURPRISE!! Did you have a good whirlwind of a trip? !